“No pain, no gain” – this has been definitely true for this release and I am sure it has been worth it 🙂 Actually I would have been finished earlier if there were no Internet Explorer out there anymore (at least v8 😉 ). 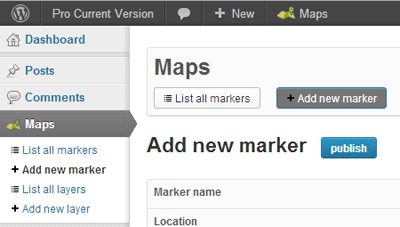 If you want to keep up to date with the latest Maps Marker development, please follow @MapsMarker on twitter, on Facebook, Google+ or subscribe to news via RSS or via RSS/email. For a live demo please visit http://demo.mapsmarker.com/. The original GPX plugin for leaflet was developed by Pavel Shramov – anyway I used the fork from Maxime Petazzoni as a basis for Leaflet Maps Marker Pro. Unfortunately I also had to fork the GPX plugin in order to fix Internet Explorer issues and overcome cross-domain restrictions (I sent the changes to Maxime who might possibly integrate them into his fork too). If you want to load a GPX track from an external domain, just enter the URL into the field “URL to GPX track”. If your GPS device does not support the export as .GPX file, please follow these instructions on how to convert your track to .GPX. By default, the metadata panel (with time, distance etc) gets displayed when a new track is added. 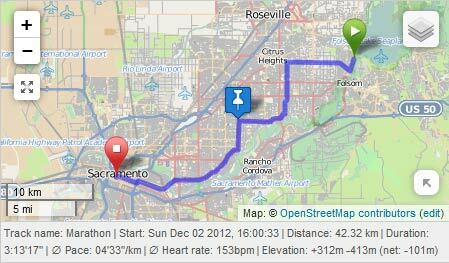 For a later pro release I also plan to add an elevation chart. If you are a developer using Leaflet Maps Marker Pro for your clients, you might be interested in this new feature, which can be found in Settings / Misc. I also enhanced the permission settings with Leaflet Maps Marker Pro v1.2: you are now able to set the user level needed for editing and deleting markers and layers from other users. By default, these settings are disabled respectively set to the same user level which is needed for editing and deleting one´s own markers and layers. Setting them to “Administrator” for example , allows non-admin-users to only edit or delete their own markers and layers. The settings page is a central part of Leaflet Maps Marker Pro, allowing you to customize many aspect of how your map is displayed. Since the launch of the first free version about 18 months ago, the number of available options grew larger and larger, making finding the right option harder. in the past I had lots of issues with plugins which enqueued their jQueryUI scripts on all admin pages and not only on their settings pages. This broke the settings page of my plugin and there was nothing I could do but displaying a warning message when such a plugin was active. I now switched from jQueryUI to bootstrap for displaying tabs and also use more unique css classnames so that this type error will hopefully not show up anymore. As next step I plan to launch the affiliate program which allows you to receive a commission on each sale that is made from a user who first visited mapsmarker.com through a link on your site for example. Details will follow soon in a separate blog post. If you upgrade from v1.2-beta1 or v1.2-RC1 please clear your browser cache once manually as otherwise the display of the settings page will be messed up. I have a question about displaying GPX-tracks: Can I display several GPX-tracks in one map or just a single one? I would like to display several tracks of a 10-week-trip plus other locations in one zoomable map. Thanks for your reply already in advance! thanks for your interest in Maps Marker Pro! 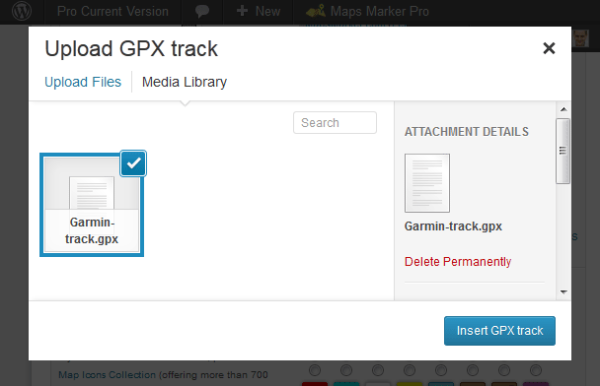 Currently only 1 gpx track per map is possible – as a workaround you can merge your gpx tracks (https://mapsmarker.com/gpx-merge) though.